Northampton’s neighborhood pharmacy, Newhard Pharmacy, was established somewhere around 1895. In 1969, John A. Pavis and Peter J. Stahl purchased the pharmacy from Aaron Newhard. 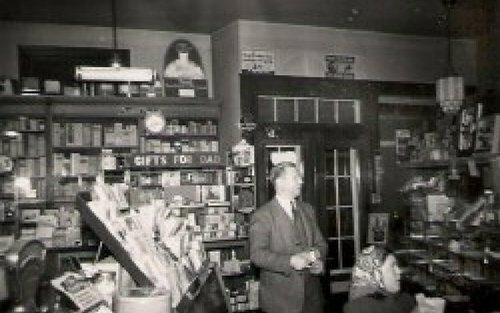 Newhard Pharmacy has been a fixture on Main Street since its opening, changing facilities as the business grew and ownership changed. In 1975, Pavis and Stahl built the current store at 1001 Main Street. This new, larger facility was built at the former site of the Northampton & Bath Railroad Station and allowed Newhard Pharmacy the space to grow to become the one-stop shop for all of Northampton. In 1994 Newhard Pharmacy established their Long Term Care Pharmacy which specializes in custom packaged medications for assisted living facilities. This business has grown so rapidly, the original building has been expanded to accommodate this growing business. Luckily, there is still room for growth on the current property which means the business will continue to be a fixture in Northampton for the foreseeable future. The next big change came in 2003 when Peter J. Stahl retired and John J. Pavis became his father’s partner in the pharmacy. Although this has been a big change for the business, John has been an employee of the pharmacy for years and shares his father’s desire to keep Newhard Pharmacy a family owned business that is deeply committed to serving its customers for years to come. Finally, in 2015, Mr. Pavis decided it was time to step back. Although you’ll still see him working hard here, John is now the sole owner of Newhard Pharmacy as of February 24, 2015 – 46 years to the date that his father & Pete Stahl bought Newhard Pharmacy from Aaron Newhard. Below you will find details such as educational background, home life, interests, etc. to better get to know our pharmacists and further personalize your experience when visiting Newhard Pharmacy. John J. Pavis became the sole owner of Newhard Pharmacy on February 24, 2015 – exactly 46 years to the day that his father and his partner purchased Newhard Pharmacy. John has brought a wide variety of experience to Newhard Pharmacy. He fulfilled his 4 year commitment to the US Army, thanks to his ROTC Full Scholarship, as a Pharmacist in the US Army at Fort Bragg, NC. He then moved to Colorado as a retail pharmacist, returning to PA in 1999 to join Newhard Pharmacy as a pharmacist manager. He is an active member of Lehigh Valley Pharmacy Association and Pennsylvania Pharmacists Association as well as a licensed immunization administrator. His passion in pharmacy is immunizations and he willingly goes to companies to give on-site shots to ensure everyone is protected. John and his wife Deborah have three sons, Henry, Charlie and George. John spends his free time coaching his son’s teams as well as leading their Boy Scout Troop. He is an avid Philadelphia sports fan and enjoys working out, snowboarding, golf, and watching live music. Our longest serving pharmacist, Tony has been with Newhard Pharmacy most of his career. He joined Newhard Pharmacy in 1981 and currently is the Retail Pharmacy Manager. Tony is an active member of Lehigh Valley Pharmacy Association and Pennsylvania Pharmacists Association as well as a licensed immunization administrator. Additionally, Tony is a PCCA certified Compounding Specialist and loves preparing specialized ointments and creams, particularly for pets. Tony and his wife, Jane have a daughter, Kristie and a son, Tony. Tony is an avid hunter, a passionate baseball fan and Giants football fan. Kyle joined Newhard Pharmacy in 2003 after several years of specializing in retail pharmacy for a chain store. In 2008, Kyle was promoted to the Long Term Care Pharmacy Manager. Kyle is an active member of Lehigh Valley Pharmacy Association and Pennsylvania Pharmacists Association as well as a licensed immunization administrator. His passion in pharmacy is long term care, he loves being able to monthly review his patients medication profiles ensuring they are compliant with their doctor’s orders. Kyle and his wife Jennifer have a son, Hunter. Kyle enjoys hunting, fishing, golfing, baseball and time with his son. Newhard Pharmacy welcomed Alison to the staff in 2009, from an institutional pharmacy in Philadelphia. She was excited to venture into retail and long term care to round out her experience. She is a licensed immunization administrator and is always investigating new specialties within the profession. Her passion in pharmacy is controlling addictive medications. She works closely with physicians, patients and caretakers to ensure addictive medications are taken as prescribed, as infrequently as possible. Alison and her husband TJ enjoy their country farm life, caring for their horses as well as traveling and spending time with family and friends. Rick was welcomed to Newhard Pharmacy in 2014 having spent the majority of his career working in retail pharmacy, primarily with major chain stores. He has been the Pharmacy Manager of several of those stores. He was excited to join an independent pharmacy in his hometown. He currently works in both our Long Term Care and retail pharmacy departments, and is a licensed immunization administrator. His passion in pharmacy is keeping current on medications, always reviewing newly launched generics and new medications ensuring we have the latest and greatest available for our customers. Rick and his wife Judy have two sons, Ryan and Matthew. He is an active member of College Hill Moravian Church in Bethlehem and enjoys all major sports, a variety of foods, summer trips to the beach, and spending time with his family. 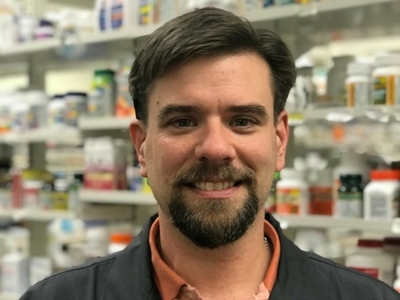 Charlie's career, he has been a retail pharmacist, a long-term care pharmacist as well as 11 years as a resident pharmacist at Gracedale County Home in Nazareth, PA. He is also a licensed immunization administrator. Charlie’s passion in pharmacy is the people he serves, he loves caring for patients and helping them live their best lives. Charlie has a daughter, Jill, and three grandsons, Tyler, Preston and Chance to whom he devotes most of his spare time. He is an avid record and CD collector, especially passionate about Motown. He also enjoys gardening and swimming. Keith owned two pharmacies in the Lehigh Valley from 1981 until 2009. He has been a compounding specialist since 1995. During that time he developed a passion for Natural Hormone Replacement Therapy which he has been consulting patients and health care practitioners since 2005. Keith developed and launched a topical muscle relaxer, Cramp911, nationally in 2009 and continues developing new products. Keith and his wife Barbara have two sons, Sean and Corey. Keith enjoys spending time with his family, working around his property and trips to Florida. Joyce has managed pharmacies in both the retail and long term care sectors. Her passion is medical advocacy, especially in the geriatric population. She desires to keep people healthy through preventive care and proactive measures and specializes in performing Medicare Annual Wellness Visits. She is also registered by Merck as a Conversation Map facilitator which focuses on diabetes education. Joyce and her husband Dan have two children, Kylie and Ethan. In her spare time Joyce enjoys cycling and international travel. She also serves as volunteer tax preparer for AARP.